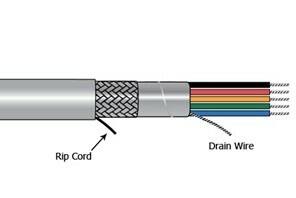 Xtra-Guard® 1 cable is a high-performance cable for general purpose applications which features a unique, premium-grade PVC insulation and jacket for easier routing of cable in small spaces. It provides resistance to oils per UL Oil Res I and Class 43, is designed for use in ambient temperatures up to 105°C, and provides exceptional protection against EMI interference when Supra-Shield is specified. Tinned Copper Conductors. PVC Insulation. PVC Jacket.